Jazz Musicians (Homo Sapiens Swingingus Maximus) are fascinating creatures. Nocturnal by nature, they live a reclusive life in close knit communities cut off from mainstream society. If you want to look for Musicians in their natural habitat, they tend to convene in the late hours of the night, attracted to alcohol and loud musical noises. They often gather in small herds, called bands. 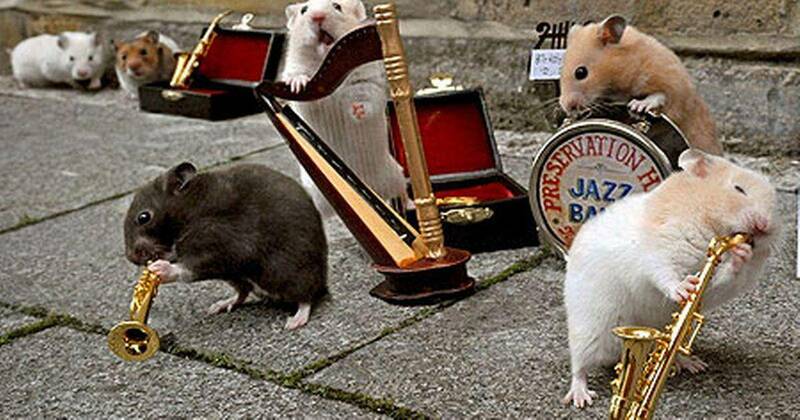 If you come across a Musician, or a band of musicians in their native environment, don’t be afraid. They are generally convivial creatures and are often as curious of you as you are of them. 1) No sudden movements. Jazz Musicians are easily startled, mostly due to varying levels of intoxication from a drinking supply of free alcohol. Sudden movements will startle and confuse them. 2) Use small words. Because Jazz Musicians are aloof creatures (and due to rule #1), an economy of words and a simple vocabulary is recommended. In mainstream culture one might say: “Good evening. It’s a pleasure to meet you.” In jazz language, a simple “sup?” will suffice. 3) Furthermore, to gain trust and acceptance within the “band,” offer to buy one of the band an alcoholic beverage—which is believed to be their primary source of sustenance. (Another dietary source is the cold sandwich, which seems to be readily available at many Musician environments). Saxophone players (Notis Multis)–fairly easy going from a distance, however close contact is not recommended, due to constant complaining about their reeds. Trumpet players (Brutus Loudnessus)–very territorial creatures. Like the Betta fish, they are docile creatures when alone, but in the company of other trumpeters, become aggressive and blow many loud and high notes to assert dominance. Bass Players (Lowus Notus)–the most docile of the bunch, caused by exhaustion from playing five gigs a day. If you look closely, you may be able to spot a Bass Player asleep while on the stage. Singers (Lookus Atmeus)–the most elaborately presented of the “band.” In the same way the Peacock uses its plume to attract a mate, the singer uses bright colors to attract applause from its audience. Trombone players (Notso Brightus)–the slowest moving of the herd, and quite harmless. If you come into contact with one, they will assuredly complain about a lack of work and ask you if you can get them a gig. Don’t worry: they ask everyone. Drummers (Bangis Thingis)–classified by biologists as a separate species to the Musician; however they gain acceptance by blankly nodding and smiling when other band members discuss melody and harmony. As unique as these species are, their future is uncertain. Evolutionary biologists have noticed some unusual behaviors that may threaten their future. Rather than mating with other Jazz Musicians, they partner for life with a musical instrument, which either they or their parents chose for them before sexual maturity. This bond is very strong, and it would be a rare occurrence to find a Jazz Musician without the company of their instrument. This has led to a decline in Musician population, and is a major cause for concern within the scientific community. So next time you find a musician in their environment, don’t be afraid to make contact. If we all work together to preserve their natural habitat (the bar), we can bring them back from endangerment and ensure a bright future for these misunderstood creatures. Reedman extraordinaire Adrian Cunningham is the leader of Professor Cunningham and his Old School Jazz Band, based in New York City. Adrian Cunningham was voted in a 2017 Hot House Jazz Magazine readers’ poll the Best Alto Sax Player in New York. His most recent album is Duologue, issued on the Arbors Jazz label. Visit him on the world wide web: www.adriancunningham.com.